First, it was the station wagon. Then the minivan. And after that, the SUV. Nowadays, families flock toward crossovers – car-based three-rowers packing cupholders, USB ports, and plenty of room for Junior, Susie, the golden retriever, and even the grandparents. But with popularity comes competition, as brands clamor for the favor of America's families. 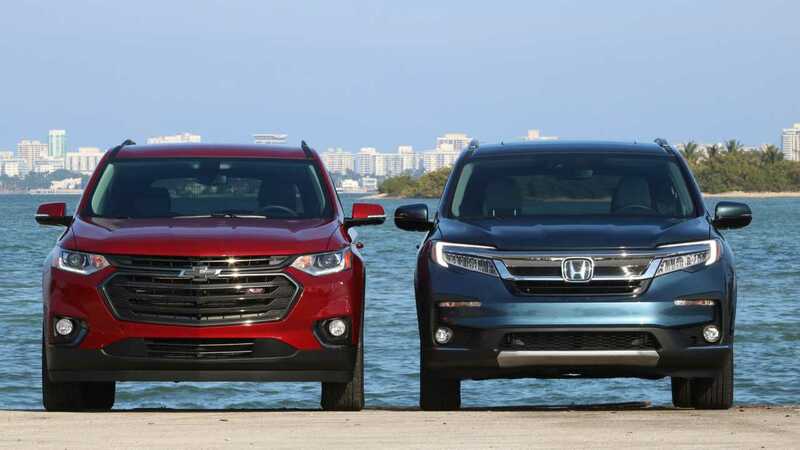 Two of the biggest names among American families, Honda and Chevrolet, each field a vehicle in the hotly competitive three-row CUV class. Each car offers sufficient room for every member of the family and the gear they bring along (grandma included). The question to answer, however, is which family hauler makes the most sense in your driveway. 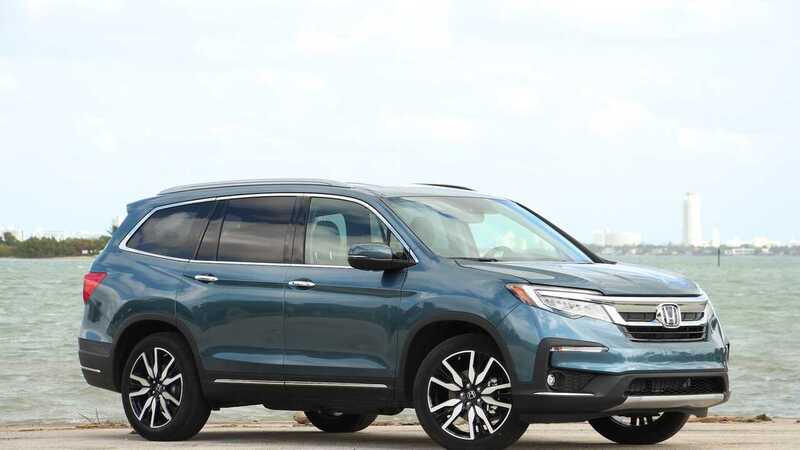 Our two competitors, the 2019 Honda Pilot Elite and 2019 Chevrolet Traverse RS, both cost north of $45,000 – a significant price considering, their mainstream status. The Honda is smaller, less powerful, and, in this test, more expensive than the Chevy. Can its recent facelift outshine the Chevy’s sleeker looks and size advantage? To find out, we pitted our long-term Honda Pilot Elite against a Chevrolet Traverse RS. 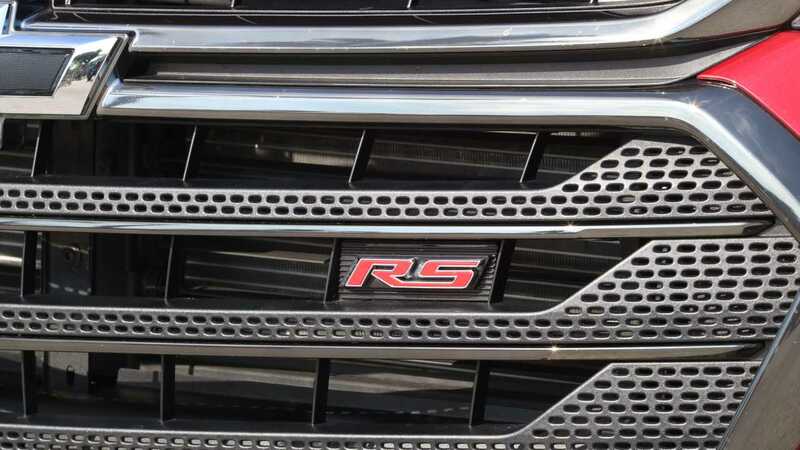 Chevrolet added all-wheel drive as an option the RS for 2019. Selecting this option means you also get the more powerful engine available, a 3.6-liter V6, good for 310 horsepower and 266 pound-feet of torque. Front-wheel drive cars come standard with a less powerful 2.0-liter turbocharged four-cylinder (but you'll want to avoid that low-powered, less-efficient setup anyway). Paired with a nine-speed automatic transmission, the Traverse RS’s engine is smooth and docile around town. Put your foot in it on a highway onramp, and the grunt is immediately noticeable. Fast? No. But given its size, the Chevy is a more-than-adequate performer. The Traverse’s size and 4,403-pound mass put the extra power from its V6 is put to the test. Especially in the tight streets of Miami, the Chevy’s long 120-inch wheelbase (eight inches longer than the Pilot’s) make navigating through slower traffic or squeezing through tight alleyways. The Traverse’s tall stature makes for a very useful view from behind the wheel, but the flip side is a substantial amount of body roll. 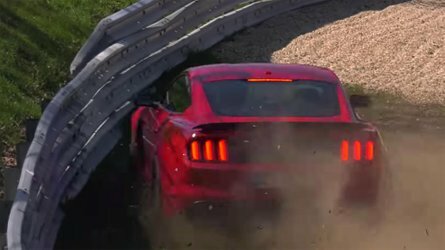 Pitch the car around a sharp corner and it instantly reminds us of the RS badge’s lack of performance credentials. But power and handling weighs less on the mind of the average crossover shopper than a quiet and comfortable driving experience, and in these areas, the Traverse excels. Happily, the stiff chassis and supple suspension smooth out a majority of road blemishes both at street and highway speeds. The Pilot’s 3.5-liter V6 puts out 280 horsepower and 295 pound-feet of torque, conceding 30 horsepower to the Traverse but beating it in the torque category (29 lb-ft). 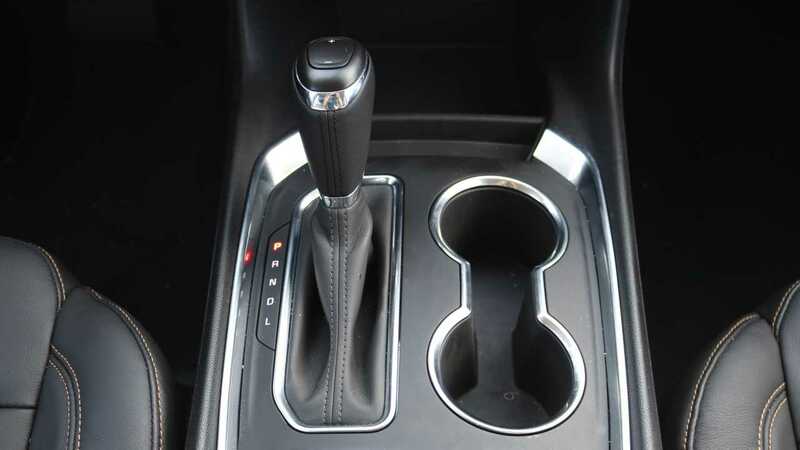 It’s mated to a nine-speed automatic transmission that works diligently and smoothly. In fact, the Pilot’s engine and transmission pairing is favorable compared to the Traverse’s – it just seems to know exactly what gear to be in at all times. Unfortunately, the Pilot’s 84-pound weight advantage over the Traverse is not enough to make up for its lower output. Both off-the-line and during highway passing maneuvers, the Honda is the slower vehicle in the pairing. That said, the Pilot’s shorter wheelbase – 112 inches to the Chevy’s 120 inches – gives it a more petite and maneuverable feel from behind the wheel. 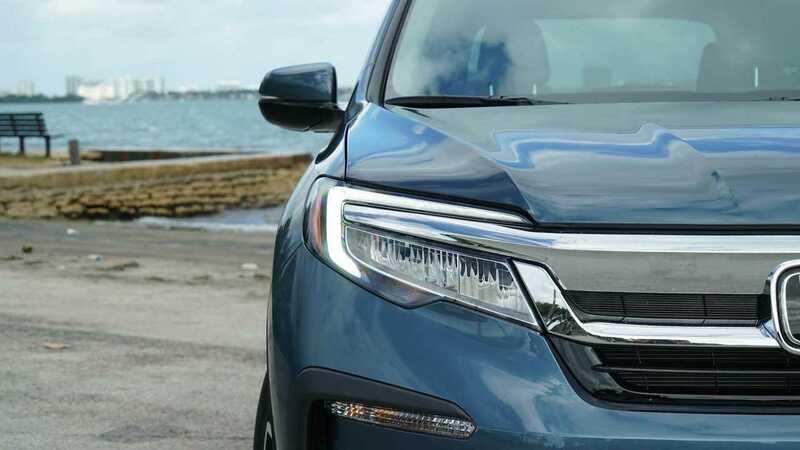 The Honda’s seating position is noticeably higher, too, giving the Pilot a minivan-like driving character, which is punctuated by the featherlight steering. There’s plenty of communication coming through the rack, but the feel is just slightly lighter than it should be. The better-packaged Honda is a breeze to drive around town, but bows to the Traverse’s better-damped suspension. Though the Honda features a soft, cushiony ride that actually fares quite similar to its bowtie-wearing opponent, bigger potholes in the road cause more commotion in the Honda. Thanks to RS kit specifics such as black exterior badging and 20-inch dark painted aluminum wheels, this red Chevy looks particularly aggressive next to the more refrained Pilot. 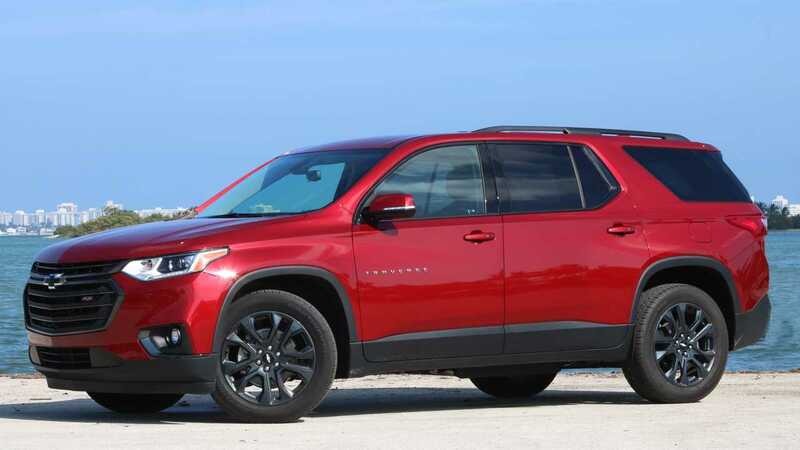 The latest Traverse evolves the looks of its predecessor, and, for the most part, its clean and cohesive styling is an improvement over the previous generation. Still, the handsome Chevy struggles to completely overcome its vast proportions, and the crossover is less of a looker from the side profile because of it. Unlike the exterior, the Chevy’s cabin does not receive any major RS-specific touches. Truthfully, the overall design is dull, with disappointing swaths of leatherette and plastic on the dash and center console. Similarly, the center console area is composed of the same two materials while the seats – though trimmed in leather, with contrast stitching – don’t feel as nice as the Honda’s. The Traverse scores points for the hideaway compartment behind the infotainment screen, and the tri-zone climate controls have straight-forward dials and a large temperature display that makes them easy to use. But those positives can’t overcome Chevrolet’s typical lack of interior differentiation between its different trims. 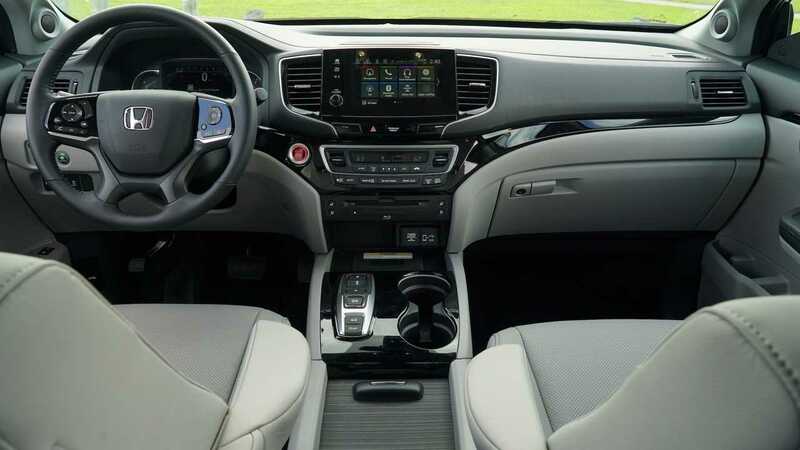 This $47,000 CUV’s cabin shares far too much with the bare-bones models you’ll find at Enterprise or Hertz. Our test car is fitted with the popular captain’s chair layout, and without a rear-center console, access to the third-row is easy. Of course, you can also fold the rear-passenger-side seat forward to easily access the rearmost row. Strangely, the driver’s side rear seat can’t slide forward for easy third-row access. The Traverse’s third row is acceptable for passengers for more than just those who don’t meet amusement park height restrictions. Overall breathing room is good, especially considering the competitors (Pilot included). 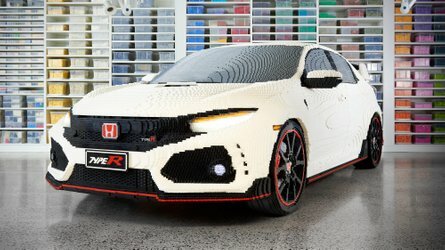 If the exuberantly styled Civic Type R represents one design extreme for Honda, then the Pilot represents the opposite end of the brand’s styling spectrum. 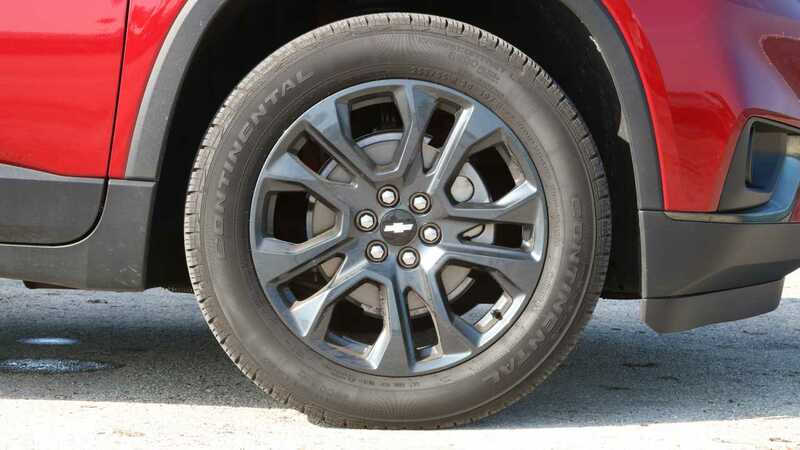 The crossover’s style is simplistic and satisfying, but certainly not striking enough to make it stand out in a crowd. Admittedly, our test car wears what we consider the best available spec (cough, because we specced it, cough). It’s a top-of-the-line Elite trim with Steel Sapphire Metallic blue paint that pops next to the bits of chrome that populate the exterior. 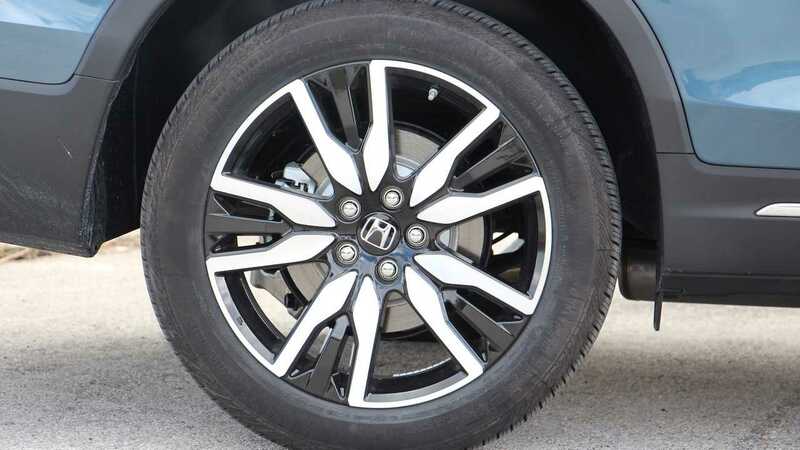 A set of 20-inch alloy wheels class things up with an attractive shape and two-tone accents. 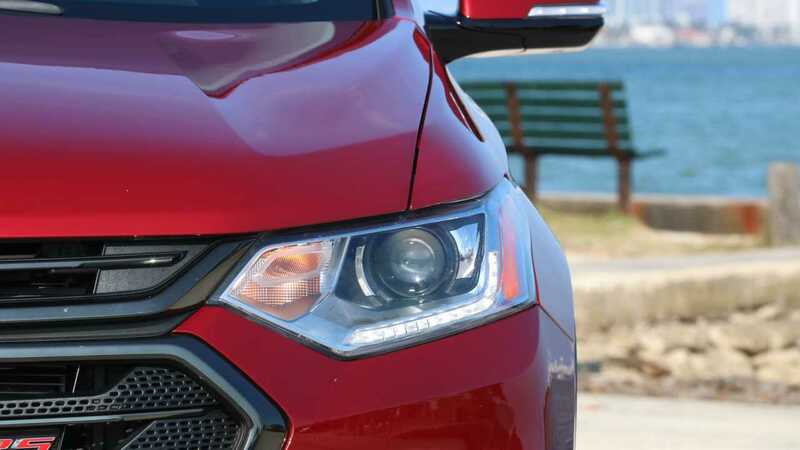 A recent facelift gives the Pilot more stylish headlights and taillights. The lamps complement a bolder grille and refreshed front fascia. It's an improvement over last year's Pilot but still fails to make the crossover stand out. 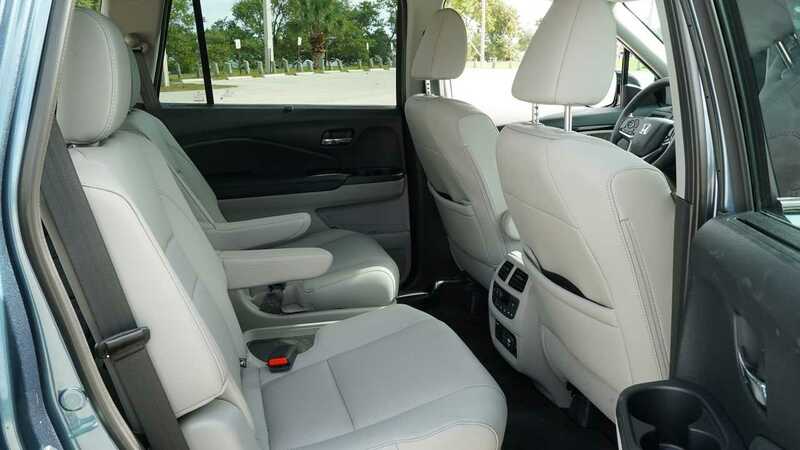 The Honda’s cabin comes equipped with bountiful storage areas and numerous cupholders, all ready to accommodate the crew for a family road trip. 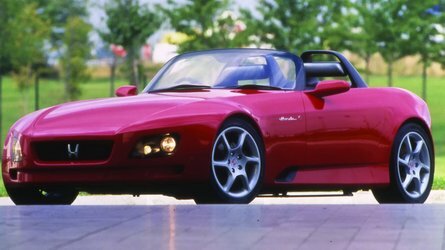 And while function is clearly Honda’s top priority, the Japanese brand didn’t overlook form. Material choices are durable and elegant, and the various plastics offer nice graining and feel relatively rich to touch. Those riding up front sit in comfortable heated and ventilated seats and enjoy height-adjustable armrests and perforated leather trim. 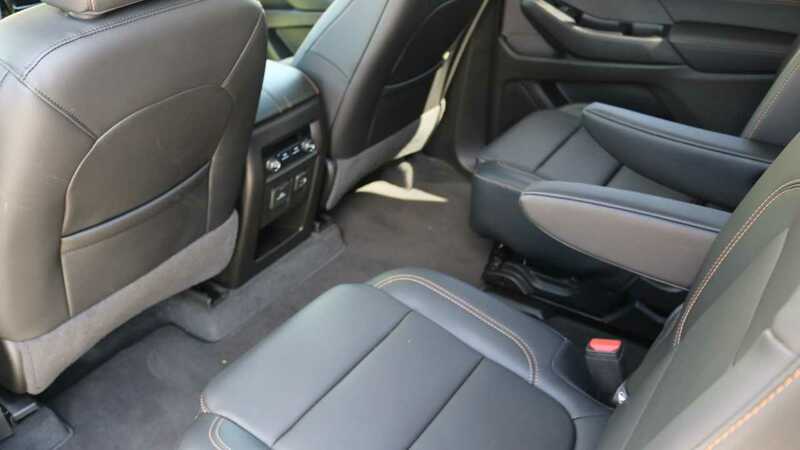 This Pilot also includes heated second-row captain’s chairs that share the perforated leather and an additional center console with two built-in cup holders. While a nice extra storage option, the secondary console does make entering the third row a bit more of a chore than getting into the Chevy’s. The third-row offers acceptable comfort, though the smallest members of the family should be relegated to the rear first. Adults can fit, too, but likely won’t want to spend much time back there unless they’ve been active in yoga class. 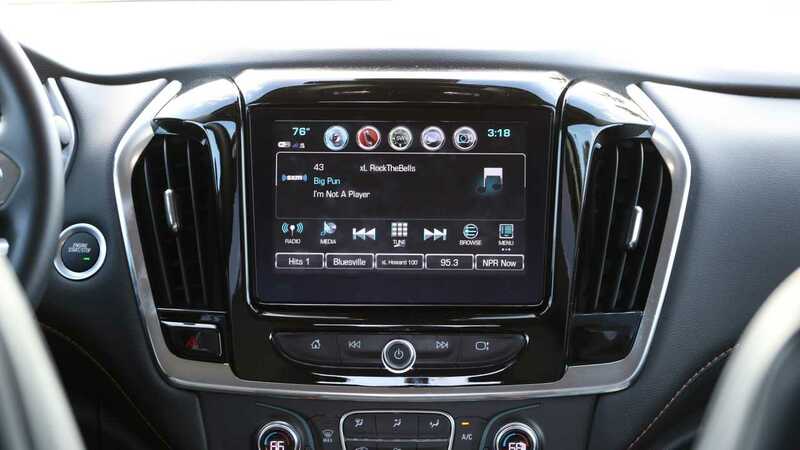 Much like its interior trimmings, the Chevy’s infotainment system is suitable, but the system lacks responsiveness at times. Using an 8.0-inch touchscreen, the display sports clear graphics, but cartoonish icons. Of greater importance to most consumers is the screen’s occasionally uncooperative responses to touch inputs. A swipe to find channel 15 on satellite radio sometimes landed on channel 40. Aiding the native software is standard Apple CarPlay and Android Auto compatibility. The Traverse also comes with an integrated 4G LTE hotspot with support for up to seven devices, and a plentiful seven USB fast-charging ports to match. Like the Traverse, the Pilot Elite comes standard with an 8.0-inch touchscreen infotainment system with navigation. 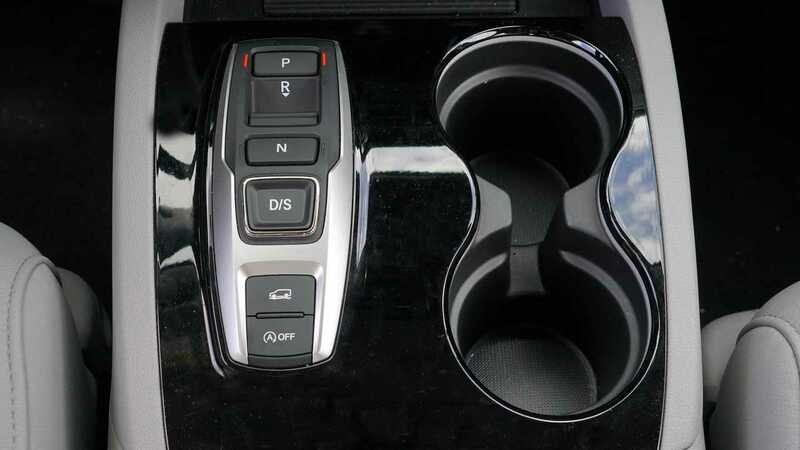 Thankfully, Honda did away with the clunky touch capacitive volume slider and replaced it with a volume knob for 2019. (And the people said Hallelujah!) Supplementing this revolutionary decision is a greatly improved, albeit imperfect infotainment setup. Although using the two car’s back-to-back showcases the Pilot’s better screen responsiveness, the Honda still falls victim at times to screen lag and freezing between menus. The home menu is comprised of square apps that are easy to reconfigure at the tap of the touchscreen. 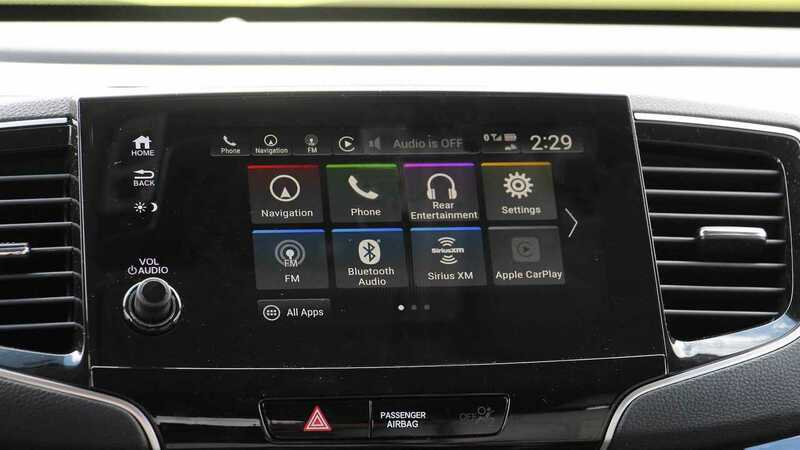 Apple CarPlay and Android Auto also come standard, which is good because Apple and Google Maps both trump the Honda navigation system in the user friendliness category, though the native Garmin-developed unit does just fine on its own. Extra goodies such as wireless charging come with the Elite, as well as multiple USB ports (one up front and two in the rear) and a 115-volt outlet (only available on EX with RES, Touring and Elite) in the backseat. Finally, a standard rear-seat entertainment system should keep the kids occupied, when they’re not counting how many cupholders surround them –there are 12, by the way. At eight inches longer than the Pilot, it comes as no surprise that the Traverse has greater cargo capacity. To frame this correctly, the Traverse has the highest potential cargo capacity of any vehicle in this segment. This breaks down to 23 cubic feet of cargo space with all rows up, 58.1 cubic feet with the third row folded down, and a cavernous 98.2 cubes with both rows folded flat. Those figures best the Pillot across the board; 5.0 more cubic feet with all seats in place, 12.0 cubes with the third row folded and 16.0 cubes with all seats folded. With its beefier 3.6-liter mill, the Traverse can tow up to 5,000 lbs, when equipped the trailering package. 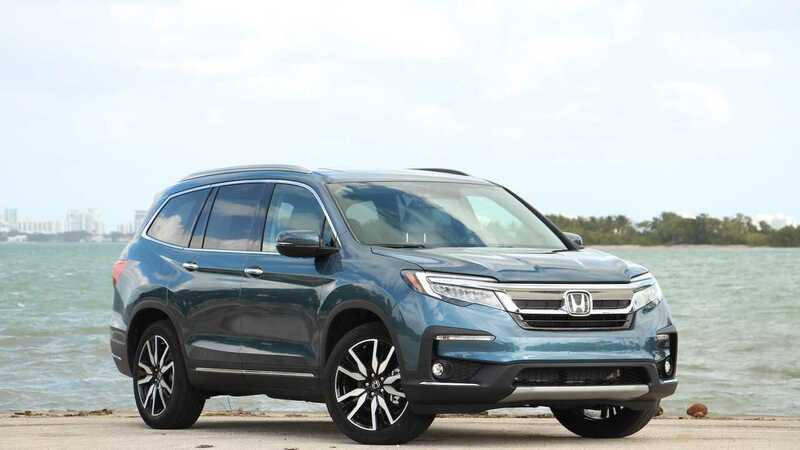 As Honda’s only three-row SUV, the Pilot’s hold is appropriately spacious, even if it bows to the Traverse, as well as its minivan sibling, the Odyssey, in overall space. With all seats in place, the Pilot is good for 18 cubic feet of cargo space and improves to 46 cubic feet with the third-row folded. With all rows folded, the Pilot swallows 82.1 cubic feet of cargo. Not included in this figure is a covered compartment beneath the rear floorboard, which can easily hold a few bags of groceries on its own. Even though it is down on power to the Traverse, the Pilot is capable of towing an identical 5,000 lbs. Crash testing has not been performed on the second-generation Traverse by the IIHS, while NHTSA gives the car a five-star rating overall. The upper-middle trim RS includes a 360-degree camera system (something the Pilot does not have), blind-spot monitoring, and rear park assist, but withholds most of the safety tech that matters in a family crossover. As is typical with a product from General Motors, the Traverse limits its most advanced and comprehensive active safety systems to its range-topping trims. Automatic emergency braking is only available as standard on the all-wheel-drive Traverse Premier and High Country, trims that start at $49,595 and $54,395, respectively. If you order your Traverse Premier with front-wheel drive in a bid to save $2,900, you’ll still need to order the $475 Driver Confidence II package to get the safety gear that, for some reason, is standard on all-wheel-drive variants of the same trim. And oh yeah, that version of AEB Chevy offers on the Premier? It only works at low speeds, typically less than 15 mph or so. The Traverse is a three-row family crossover that offers next to no active safety gear without dropping at least $47,000. To be blunt, it’s egregious and unacceptable in a world where Honda offers its Sensing system as standard on every version of the Pilot. Building on its win in the technology category, the Pilot asserts further dominance in the safety segment, with its robust safety suite, Honda Sensing. As we just mentioned, Sensing is standard on every Pilot and includes automatic emergency front braking, lane-departure warning, adaptive cruise control, rear cross-traffic alert, and lane keeping assist. This impressive collection earns the Pilot an IIHS Top Safety Pick designation. It is the clear winner in this category. With its bigger V6, the Traverse earns 17 miles per gallon in the city, 25 on the highway, and a combined 20 mpg. Like the Pilot, it runs on regular fuel and holds 21.7 gallons in its tank, allowing the Traverse to travel around 540 miles on the highway before needing a refill. The Honda Pilot wins the battle of efficiency, with EPA ratings of 19 mpg city, 27 highway, and 22 combined mpg. It runs on regular fuel, too, and holds 19.5 gallons of fuel, or enough to take the Pilot about 429 miles on the highway before needing a refill. A base L Traverse rings in at $29,930, while the Traverse LT with leather starts at $40,295. The step up brings extras such as lane-change assist and power liftgate. Our RS AWD test car starts at $45,550, adding $395 for the wonderful coat of red paint, while an extra $995 is tacked on in destination charges. 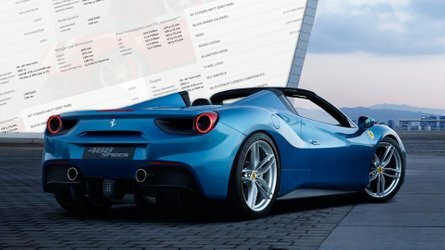 All in, our test car costs $46,890. Those looking to load up a Traverse should look at the High Country, which costs $54,395. Sitting atop the pile is the High Country, which includes adaptive cruise control, emergency autonomous braking, and a power-folding third-row seat. Lots of kit, but with a price tag to match. Starting just ahead of the Traverse L, the base Pilot LX costs $31,450. Stepping up to the EX is an additional $2,880, but brings features such as Apple CarPlay integration and the 8.0-inch infotainment screen. Next is the well-equipped Touring that checks in at $42,520. This is the real sweet spot in the lineup with sought-after features such as a 590-watt sound system, LED headlights, and hands-free tailgate access. The top-range Elite starts at $48,020 and is basically a Touring with a few extra creature comforts like wireless phone charging, panoramic roof, and heated/ventilated seats. With no additional accessories, our test car rings in at $49,065, including a $1,045 destination charge. There’s a good reason why these two crossovers sit in the upper echelon of the crowded full-size crossover segment: both are capable, usable family haulers with loads of storage space, and large and airy interiors. Either is a great choice for suburban runabouts and long weekend road trips, but in a battle between these two mainstream crossovers, even the smallest details matter. 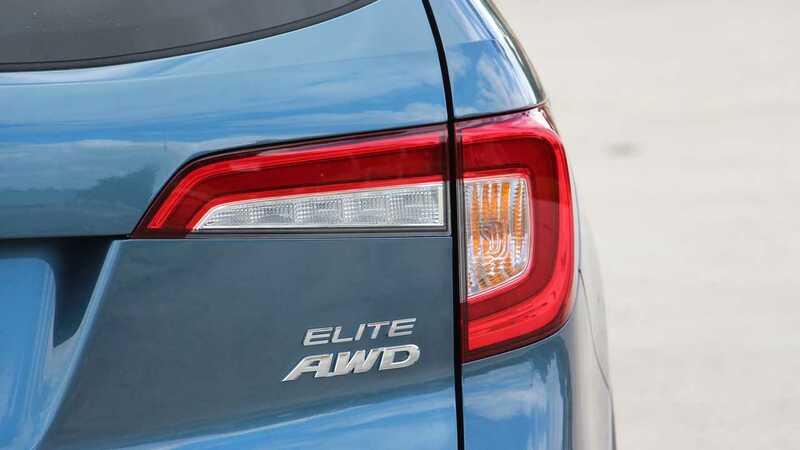 And in those smaller details, the Honda Pilot Elite proves to be the better vehicle, making it the winner of the comparison test. A more refined interior, extra features for the money, and stellar standard safety equipment make the Pilot the vehicle to have. While a top-trim High Country Traverse may fair better against the Pilot Elite, that car out-prices this comparison by more than $4,000. 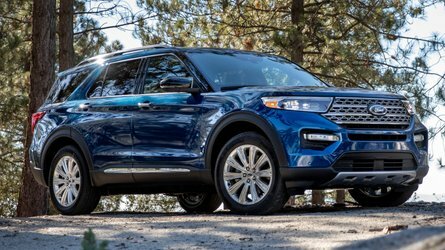 Despite the third-gen Pilot passing its mid-life point, it still feels like one of the best options in the segment and impresses enough to win this comparison test.